Texoma Trailer Body & Welding has service bodies for any industry, including plumbing, landscaping, electricians, tree services, chipper beds, and more. You can count on our team to deliver a quality service body that will meet all of your needs. We will work with you directly and make sure you get exactly what you want. We attend to every last detail that matters to you. When you get a service body for your trade from us, you can be sure you’re working with a fully licensed and insured company. Our service bed supplier is Knapheide, a brand that’s been around since 1848. Their standard service truck beds have a rugged steel construction with ample external storage for tools and other equipment. The goal of these service bodies is to optimize day to day productivity by staying organized between job sites. Compartments have adjustable shelving, double panel doors, and rotary latches. There are several types of bodies available, including platform, gooseneck, dump, forestry, and KUV bodies. There are several customizable options available with service bodies, and we offer all of them. These include aluminum tread plate trim, modular tail shelves, pull-out trays, cable steps, cargo tie downs, padlocks, and crane reinforcement kits. Additional options include grab handles, utility racks, LED lighting, cab guards, rock guards, sliding roofs, and more. 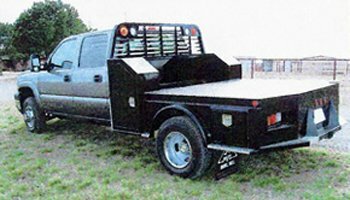 Texoma Trailer Body & Welding also has customizable truck beds available to modify any type of truck. This includes truck bed parts such as liners, tool compartments, locking systems, and truck bed covers. If you need more space to haul lightweight equipment and supplies, we have the experience and parts needed to modify your truck bed to meet your needs. Our staff will consult with you to uncover your specific needs and create a solution for you.